A large number of computer users who’re running recent versions of Windows aren’t aware of the hidden options in file or folder context menu. In addition to options that appear when you right-click on a file or folder, you can reveal hidden options by pressing down the Shift key while right-clicking on a file or folder. And users who’re aware of the above secret and know the potential of context menu might want to enhance context menu by adding new options to desktop and explorer context menu. Over the years, a couple of free tools have been released to add new entries to the context menu and there are even tools that enable you add webpage URLs to desktop context menu so that you can launch your favourite websites by right-clicking and then selecting the URL. The problem with most of these tools out there is that all of them offer similar options. For instance, most of them let you add Copy to and Move to options to the context menu. Easy Context Menu is not just another context menu enhancer. Unlike other tools released before, Easy Context Menu allows you add a variety of options that you will actually use. 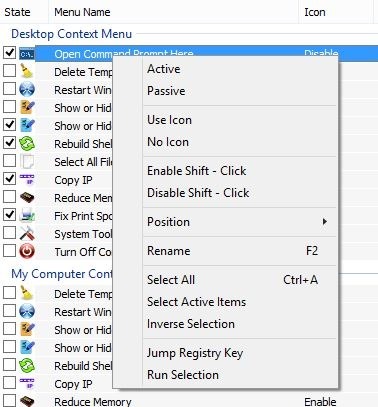 The current version of this free tool over 30 options and lets you add options to desktop context menu, My Computer (This PC or Computer) context menu, drives context menu, folder context menu, file context menu, system tools sub menu, and turn off computer sub menu. The beauty of this tool is that you can select the position of newly added entries, hide or show icons for options, and even add an option to the hidden context menu (that appears when you hold down the Shift key while right-clicking) to avoid cluttering the context menu. Easy Context Menu is extremely easy-to-use. Just download the zip file, extract the same to get x86 and x64 executable, and then depending on the flavour of Windows you’re running, double-click on x86 or x64 executable to launch the program. Select options that you would like to add and then click Apply changes button to add selected options. You can right-click on an option to view advanced options. 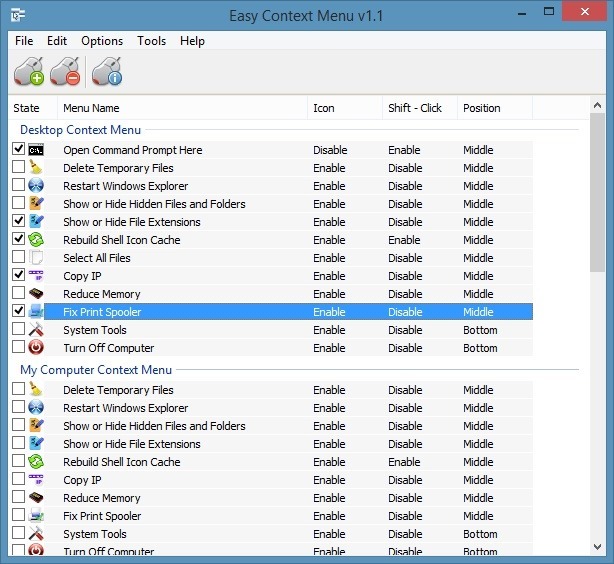 Easy Context Menu is compatible with all recent versions of Windows operating system including the latest Windows 10. QEMU Simple Boot is another excellent software from Easy Context Menu developer to test bootable ISO file without burning. How to add uninstall option to right-click menu article might also interest you. 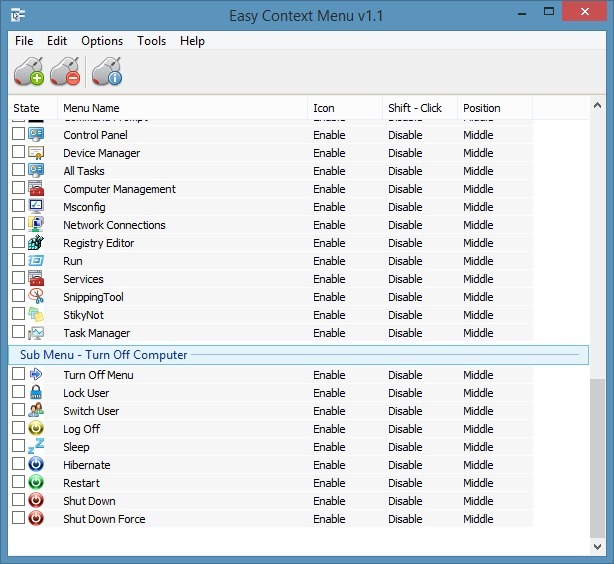 Any changes or updates you make to your context menu can only be used with the easy context menu software installed on your pc. The program adds files to your program files that are required to run any changes you make to your context menu. Because of this, all changes and modifications you make only work where the program is installed. 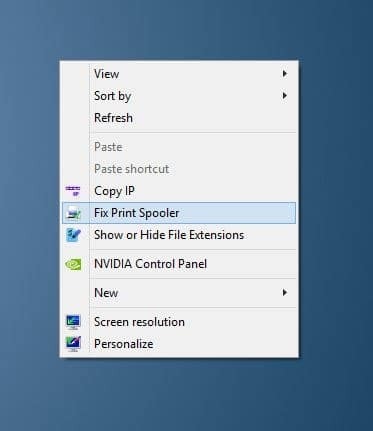 This make all changes, corrections or customization of the context menu useless on your other computers – you cannot use your customized menus on other computers or if you rebuild your pc. If this program only edited the registry and did NOT have to use outside files – you could save your custom menus as .reg files and use them anywhere you want. You could rebuild your pc and automatically recreate your custom menus. You could create custom menus and use them on any other pc.